Apple’s next-generation iPhone won’t be officially announced until September, but that doesn’t stop the rumor mill from going into overdrive early. We won’t know exactly what the Apple has in store for us until the covers are removed from the device, but if you simply can’t contain your excitement and are happy to base your decisions purely on speculation then you can already purchase a working clone of the “iPhone 6”, designed and manufactured entirely from the leaked designs and components over the last few months. The handset has been dubbed as the Wico i6, and although it hasn’t been manufactured to the same high specifications that an official Apple device would adhere to, it does offer a fully functioning “iPhone 6 and iOS 8” experience. The hardware has been knocking around for a little while now but has finally been captured in a hands-on video for the first time, allowing us to get a proper glimpse of what’s being offered by the Chinese team behind the hardware. The hardware and overall user-experience of the Wico i6 is nowhere near representative of what we will ultimately see leaving the Cupertino doors in the fall. However, it does offer a rare opportunity to see what it would actually be like to use and interact with a functioning “iPhone” with a 4.7-inch display rather than just imagining the experience based on impressive, but static concepts or renders. The underlying software that powers the Wico has been themed in an attempt to mimic the visuals that come as part of iOS. From a purely visual perspective the device is almost identical to a number of the more believable concepts that have appeared in the last few weeks. The less-than-impressive build quality is immediately apparent during certain parts of the video, but it does give a fairly good insight into what we can expect. When the official device does eventually ship later in the year we are expecting a dramatically overhauled smartphone with an embedded next-generation A8 processor. It’s also widely accepted that we will see a 4.7 and a 5.5-inch version by the beginning of 2015. 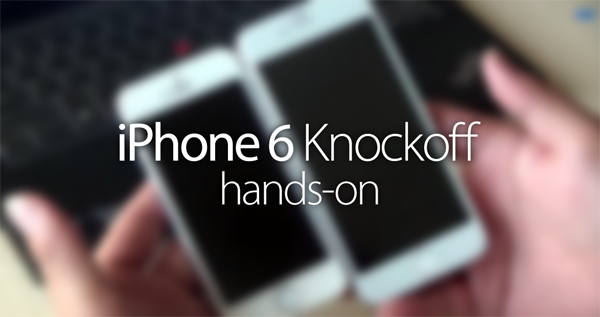 Check out the hands-on video of the Wico i6 for yourself and see what you think.